Ever wish you could style your entire workbook with just a few clicks? 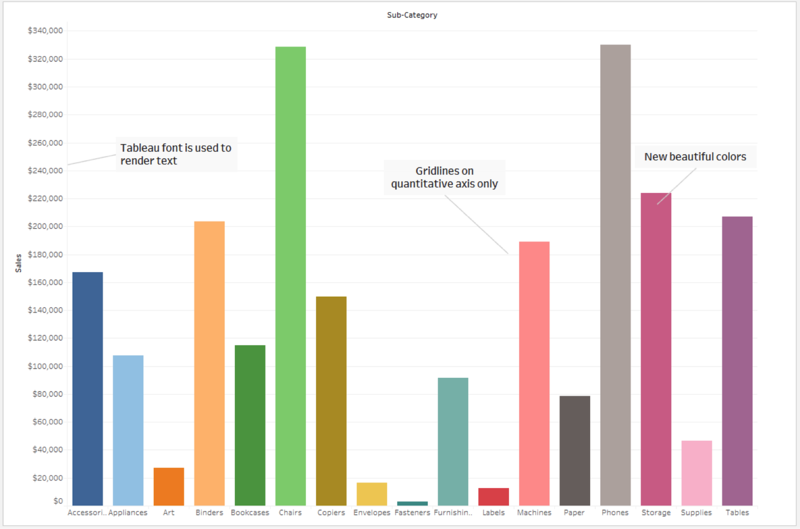 Now you can in Tableau 10! You can also easily undo any of the changes you made, which means you can explore without losing your work. You might have noticed that things look a little different in Tableau 10. That’s because we’ve introduced a beautiful new theme designed to make your data pop. Tableau 10 features a new font designed specifically for data visualization. This font is legible even in small sizes. We’ve removed extraneous items like borders to drive your attention to what matters most, the data. Even more visual best practices are now at play. For example, quantitative axes now show gridlines by default. 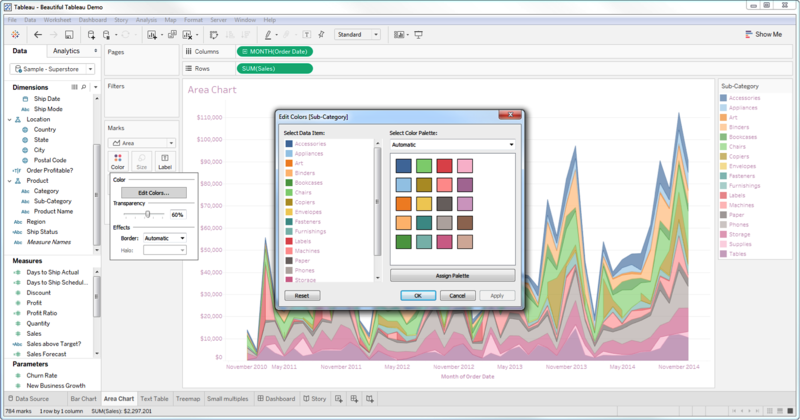 We’ve redesigned all of our existing color palettes and added some new ones for the first time since Tableau 1.5 to give a more sophisticated and coordinated look. Our new palettes include soft and beautiful colors that are designed for both visual perception and aesthetics. We’re excited to bring you these features, and we’d love to know what you think. Tableau 10 is currently in beta. We have a timeline for getting Tableau 10 out the door, but we’d first like to get solid usage in beta and fix any bugs. We want your feedback as early as possible to catch any issues and ensure the new features are great. All you did is change the default settings! Start updating the really important things like new visualizations. The new workbook formatting feature actually allows you to update fonts across your entire workbook with just one action (compared to previous versions, where you would have to change the fonts in every worksheet one at a time). We believe this will make formatting easier and quicker for many customers who need to apply the same formatting across their entire workbook. The updated defaults will make your visualization beautiful and allow your data to pop without much effort on your part, also making creating visualizations easier. If you have a specific idea for a new visualization type that you would like to see included in Tableau, please enter it in our idea forum here: https://community.tableau.com/community/ideas. We value your feedback, so please do keep your thoughts coming! In my opinion, this is the least significant 'improvement' (if you call it that way). I have hoped for more than just font changes.... say, theme as an example as a more adding value improvement. Agree with the comment. Add some real functionality like a built in customizable fiscal calendar that is able to leverage formulas like date part and datediff. Not sure what Fortune 500 hasn't been begging for this for probably 10 years!!! When Tableau 10 to be released. We have a timeline for getting Tableau 10 out the door, but we’d first like to get solid usage in beta and fix any bugs. We want your feedback as early as possible to catch any issues and ensure the new features are great. I'd love to be part of the beta test. How do I upgrade to 10.0? very nice to see ...beautifull.. Thank you for making it possible to style an entire workbook at one time. I was spending so much time customizing each individual worksheet. This will be a huge time-saver. Thanks A.J. - we are glad to hear that the Workbook Formatting feature will be useful. Great feature Rubaiyat Khan, to update all sheets at once, its a great time saver. Thank you Pranay, we are glad this feature will be useful to you. Very helpful addition - thank you! Would be nice if we could save the global font / color settings as a template that we could apply to other tableau workbooks. Formatting option is very helpful to format the entire workbook in fraction of seconds. Really it saves time. New color palettes looks cool. I would like to view the "pages" feature on tableau public too so that the user can can click on the "play" button and view the transition. Looks like one of the most basic features of all time is still not included in Tableau, which is dynamic formatting. If you have a parameter that swaps out metrics (i.e. count of users to conversion rate), it looks like you still cant make the rate a % format, and the count another format. This is something Qlikview has had for 10 years. This is so basic its painfully embarrassing that tableau has not caught up here. it's like shipping Tableau without the ability to add and subtract, thats how basic we are talking. Removing Borders is a terrible and extremely trendy idea. Sometimes it's important to include those lines to help guide the user to what's important, or to help emphasize meaning. Removing borders only reduces the usability of this software.